There may be more financial planning to be done in the next ten years than there are financial planners. As the U.S. population ages and Baby Boomers begin to retire, the Bureau of Labor Statistics suspects that their services will be a hot commodity and that the field will grow faster than others in the same time period. 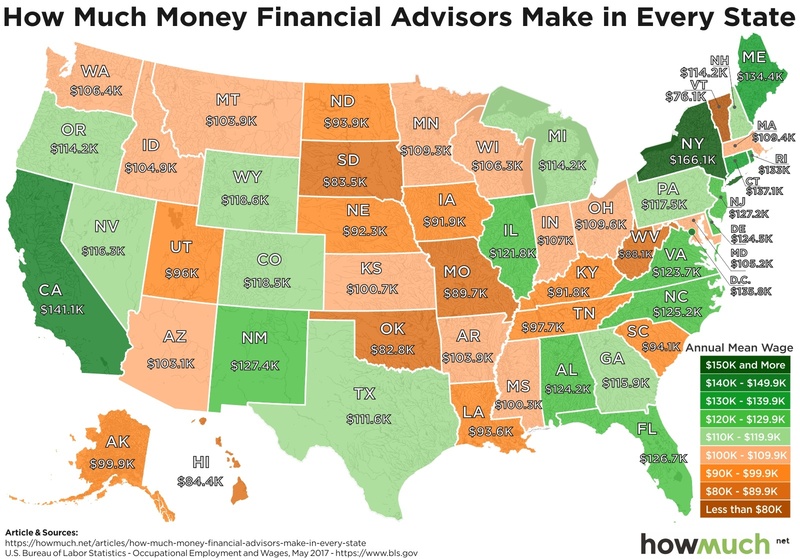 How much do financial advisors make, on average, in your state? Personal financial advisors are making pretty good money these days. The median salary for this type of position ranges from $76.1K to $166.1K across the country, and the median income for financial advisors in 2017 was $90,640. Compared to the national average household income of $60,336 according to the Census Bureau, financial advisors across the nation are doing pretty well for themselves. Financial advisors in states where they make the least (on average) are still making more than the average household in America is bringing in, and ‘household’ frequently means two or more incomes. These higher-than-average salaries can be attributed to the education, skill, and extra hours put in to meet with clients on nights and weekends, but it can also be attributed to the fact that it’s a service that’s in high demand. There’s no doubt that the U.S. population is aging. Aging people tend to want to retire, and financial planning is a big part of making that happen. Because of this, the Bureau of Labor Statistics expects the field to grow 15% between 2016 and 2026. That’s a much faster rate of growth’ than is expected of all occupations despite that robo-advisor services are becoming more common in this industry. Despite that robo-advisor services may be cheaper, they’re not for everyone. This means that despite the sci-fi trope about robots taking over human jobs, the technology that allows robo-advisors to operate typically works alongside real-life advisors rather than co-opting their positions. While the numbers above won’t necessarily tell you how much you’d pay a financial planner, they might just convince you to set out on a new career path (or maybe encourage your kids to do so).